The MN Visual Journal Collective meets 12 times a year on the third Monday of the month, from 6 to 8 p.m. at Wet Paint. 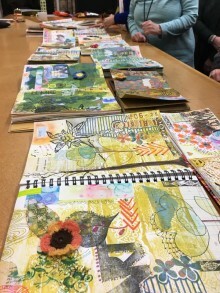 Meetings are free and open to any adult who is interested in keeping visual journals. All skill levels are encouraged from beginner to life-long journal keepers. We are an eclectic, curious, and welcoming adult group interested in sketching and observing our lives. Come and join in the fun! Briana and TJ maintain the MN Visual Journal Collective on Facebook which you are welcome to join. As volunteer coordinators Briana and TJ also organize the meetings. Looking to the membership’s talent, expertise, and interests to provide topics for the meetings as well as volunteers for brief presentations. The group also devises and executes collaborative projects such as an Altered Book Journal Round Robin, an ATC directory, a journal zine project zine exchange and our 2013 Not-so-Blank-Page Journal Project. Meetings include discussion and sharing of current journal work.